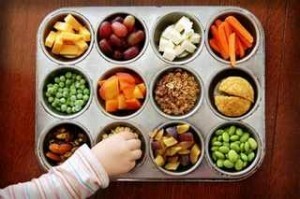 Perhaps one of the common downfalls when it comes to sticking to the Paleo diet is snacking. When your stomach is grumbling and you don’t have the time or the patience to whip up a healthy meal, guess what? Like many, you are probably not in the best state of mind to talk yourself out of heading towards the vending machine or the nearest food stall, right? One of the major reasons why people fail to stick to the program is mainly due to the inconvenience of looking and preparing Paleo-friendly meals and coming up with Paleo diet snack ideas. When you are stressed, tired and hungry and you are faced with the option of grabbing a readily available donut or racking your brains for easy to prepare Paleo diet snack ideas, you probably won’t think twice about choosing the former. With all the temptation of unhealthy food just around the corner, you need to be fully equipped with Paleo diet snack ideas to satiate in between meal hunger and cravings. 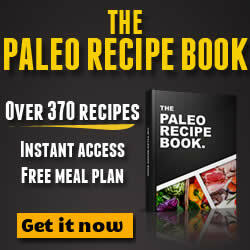 In my previous post, I have emphasized the importance of Paleo diet food tips – preparing meals ahead of time – the same advice holds true when it comes to Paleo diet snack recipes. Whoever said chips have to be greasy and totally unhealthy. 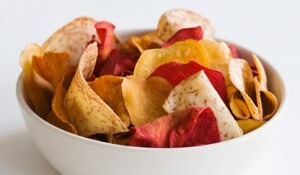 Stock up your pantry with veggie chips, without the potatoes, of course. A great alternative is the trusty eggplant. Simply use a food processor to shred the eggplant, mix it with egg and a bit of sea salt before baking it in the oven for 10 to 12 minutes at 450 degrees. Make sure to store in an airtight container to retain crispiness. You can also try experimenting carrot and kale chips. A smoothie is always one of the most satiating and healthiest Paleo diet snack ideas that you can prepare in minutes. Simply mix crushed ice or coconut milk with your favorite fruit such as berries and whip it one in less than a minute. To further enhance the flavor, you can consider adding just a small drizzle of vanilla extract. 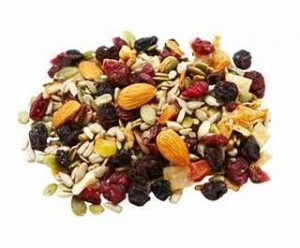 Another healthy and convenient addition to your Paleo diet snack ideas is the trail mix. Like chips, you can prepare and store a large batch that you can conveniently access anytime. This Paleo diet snack recipe is basically made of nuts, dried fruits and seeds, which as you already know are also part of the Paleo diet. To prepare, simply mix your favorite nuts, seeds and dried fruits such as almonds, pumpkin seeds, cashews, dried blueberries, dried currants, raisins and sunflower seeds. You don’t need to cook or bake the mixture just make sure you store it in an airtight container to prolong shelf life. Embracing the Paleo diet doesn’t have to be complicated or elaborate. Simplify your food choices by going back to the basics.